Dragon Racer is a fast-paced card drafting strategy game that is easy to learn, but wickedly hard to master. It features a unique combination of card drafting and set collection that makes every game a new and exciting challenge! Compete for cards to fire up your team of dragons and advance along the racetrack. After 7 turns, the player who goes the furthest is the victor! 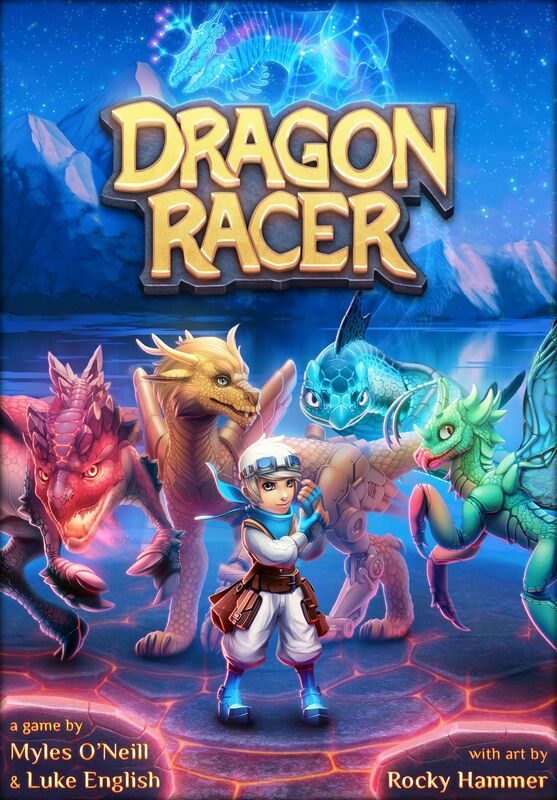 You can combine two copies of Dragon Racer to play with up to 8 players. Set up the racetrack in the middle of the table. Remove one random upper track tile and one random lower track tile and place the 6 remaining upper/lower track tiles colored-side down (face down) between the corner tiles. Every player gets a character card, a matching dragon token, and a random trophy card. Players each place their dragon token on the starting line. Remove dragon cards from the game based on the number of players (see page 5). Sort the remaining dragon cards into 4 piles based on their level. Each player gets 3 random level 1 dragon cards and places them face up next to their character, this is their racing team. The remaining level 1 and level 2 dragons are shuffled together to make the starting dragon deck. Each turn is made up of the four phases described below. On the first turn of the game, skip the explore phase. At the end of the 7th turn, the player who is furthest along the racetrack is the winner. Reveal the next face down racetrack tile and add its associated dragons to the dragon deck. Assign trophy cards to players according to their position in the race. Deal each player a number of dragon cards (2 + the turn number) from the dragon deck. Players simultaneously draft these cards face down until all cards are taken. One at a time, in reverse trophy order (i.e. last place goes first), players take turns racing. During this phase you reveal all of the cards you drafted, then use them to Fire Up dragons on your racing team (moving you clockwise along the racetrack) or to attack other players. At the end of the phase you may swap one of the dragon cards you collected with a dragon on your racing team. Finally, the players with the most dragons from each racetrack type are awarded an extra Boost, moving them even further along the racetrack. At the end of the turn, all dragon cards that are not on racing teams are shuffled back into the dragon deck and the next turn begins with the start of a new explore phase.